I wish I could say that these problems were rare, but they are not. I run into these problems quite frequently. Admittedly, it is usually when a person who is not trained in marketing is at the marketing helm of his or her organization. Apparently, people responsible for choosing a marketing head (in some organizations) think that little skill or experience is required to do the job well. But that is a topic for another blog post. There is no brand positioning. There is no brand architecture. There are no brand identity guidelines. The logo is not functional for all uses. No one has established a hierarchy of target customers. There is no communications plan or media plan. The marketer responds to the most compelling media pitches, often resulting in a completely ineffective and inefficient mix of publications and media vehicles. Organizations only target and interact with their current customers, not new ones. Organizations rely exclusively on social media for their marketing efforts. Organizations forget to solicit email addresses and other contact information at trade shows and other outreach efforts. Organizations assume that a good website with good SEO efforts is all they need to build brand awareness. Advertising focuses exclusively on functional (versus emotional) messages. They load marketing communication up with multiple complex messages of brand benefits thinking that will make the communication stronger. 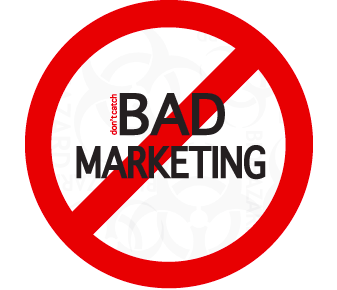 They conduct deeply flawed marketing research. Maybe they solicit the wrong people for their responses. Maybe the survey instrument is designed in such a way that there is significant biasing. Maybe the sample size is not large enough to conclude anything definitively. Sometimes the analysis (and its underlying logic) is flawed. The marketing program consists primarily of price discounts and other price promotions because it results in a (temporary) sales lift. They have little to no marketing budget because they don't believe in the power of marketing or because they believe the product should sell itself. They never stop to think about the customer's beliefs, attitudes, values, hopes, fears, shopping behaviors, product usage behaviors or anything else that would help them design successful marketing programs. There is no "integrated" marketing. It is all conducted ad hoc as opportunities arise. Nothing is designed to work together. I hope you do not have these problems. And I hope this makes you feel good about your marketing abilities. I wish you great success with your marketing efforts.